In Epic Mutant Missions Game, help recover master Splinter’s that went missing. 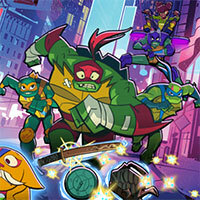 Join the TMNT as they go different missions to find the missing items and fend off bad guys that try to get in your way. Explore different locations in the big city of Manhattan. You are going to join the turtles in some awesome action-packed missions. Complete multiple missions, and for doing so you will get rewarded with trophies, as well as Splinter’s mysterious items. In each different part of New York you will do a different mission. And before you start each of them you will know how this works. So pay attention to the instructions, and then give the mini-games your very best! Enjoy and have fun in playing Rise of the Teenage Mutant Ninja Turtles: Epic Mutant Missions Game. Also make sure to check out TMNT Monsters vs Mutants Game, you may enjoy playing it.